From our experience on feature model analysis we have performed a domain analysis process with the aim of detecting the common features of different analysis tools. Those features and the different extension points are part of the FAMA FW Core. The remaining features are provided as FAMA Extensions. QuestionTrader: interfaces for a query-like interaction with FAMA FW. They are uncoupled from FAMA Core so changes on it does not affect the ﬁnal user. FAMA Core: communicates different extensions among them. Reasoners: add new reasoners or solvers developed by third parties. By default, JavaBDD, Choco, JaCoP GPL and SAT4j are provided with the tool. Questions: incorporate new reasoning operations. Products counting and listing, error detection and explanation, and products ﬁlter are included to date. Reasoner Selector: select at runtime the reasoner to answer an analysis question among all the available reasoners and based on a previously deﬁned criterion (performance, accuracy,...). FAMA FW allows to develop your own smart selectors. Benchmarking: compare different reasoners performance for the same peration. A random feature model generator is provided allowing to store the data and results for a later analysis. 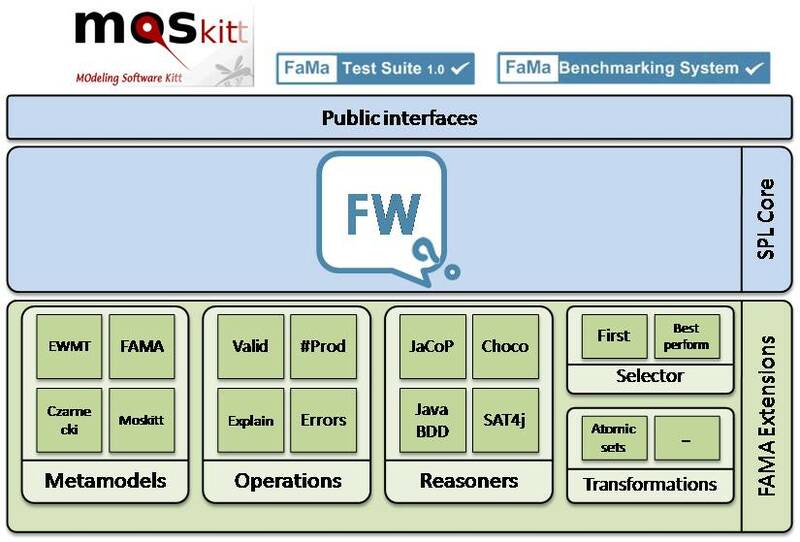 Now Fama Benchmark is another powerfull tool that internally can use FaMa or another frameworks.